going back le... tired looking~~ liling faking a smile..
itsa my head... trying to look relaxed......... ^^ but failed..
this is the grp of us to sentosa that day!!! but huiling haven join us... we had a great time tat day!!! 3rd time to sentosa... its the day i became truly dark!!!! 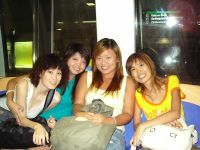 joanna, pc, liling and mEEEE!!! !